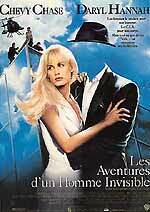 Warner Home Video will release John Carpenter's 1992 misfire Memoirs of an Invisible Man on January the 19th. The disc will feature a new 2.4:1 ratio transfer, with Dolby Digital 2.0 Pro-Logic audio, and has an RRP of £12.99. The disc has a smattering of bonus materials: outtakes, How to Become Invisible featurette, an Easter Egg (Chevy Chase on set) and the theatrical trailer. Two classic Ray Harryhausen movies will be released by Warner Home Video on the 26th of January: The Beast From 20,000 Fathoms and The Valley of Gwangi. 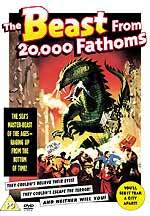 The Beast From 20,000 Fathoms, from 1953, based on Ray Bradbury's short story The Foghorn, will be presented in 1.33 full-frame ratio, with mono audio. The disc will feature two featurettes, The Rhedosaurus and the Rollercoaster: Making The Beast (6m), and Harryhausen and Bradbury: An Unfathomable Friendship (16m), as well as the theatrical trailer and an Easter Egg (there's footage of Harryhausen demonstrating his model's armatures on the Region 1 version). The Valley of Gwangi, from 1969, pits dinosaurs against cowboys, and features some of Harryhausen's best work. Warner Home Video's disc will have a 1.85:1 transfer, and mono audio. Bonus materials include a featurette, Return to the Valley (an eight-minute tribute to Ray by some of Hollywood's leading special effects designers) and an Easter Egg (another short Harryhausen interview, if it's the same as the Region 1 disc). 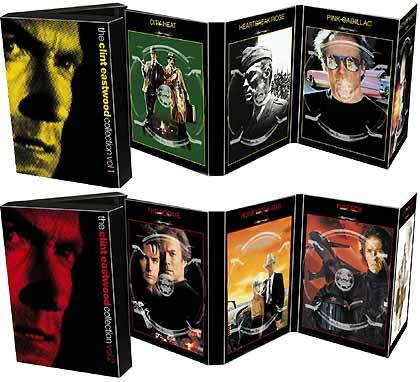 Here's a closer look at the two Clint Eastwood Colllection DVD box sets, due on November the 24th (see News entry for the 27th of October for more details). It's been a while since I received copies of the latest soundtracks from Film Score Monthly magazine (last month they had Jerry Goldsmith's score for the 1971 western Wild Rovers, and Leonard Rosenman's music for The Cobweb and Edge of the City). 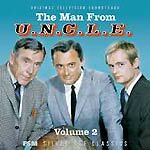 This month, though, they've returned with a vengeance, with a second two-disc collection of music from The Man From UNCLE TV series (featuring almost half an hour of previously-unreleased Jerry Goldsmith cues, and music by distinguished colleagues like Lalo Schifrin, Nelson Riddle, Gerald Fried). The disc draws music from all four seasons of the show, including an unused version of the first season End Title (by Goldsmith), a suite from the pilot episode, The Vulcan Affair, (also by Goldsmith), and an alternate version of the forth season Main Title, an arrangement of Goldsmith's theme by Gerald Fried. The Man From UNCLE Volume 2 features two-and-a-half hours of music (including more than half an hour taken from the three-track half-inch masters created for the fourth season and the theatrical feature compilations). The disc comes with a richly illustrated twenty-four page booklet, with notes by TV music expert John Burlingame. RRP for the set is $24.99. Film Score Monthly's latest Golden Age Classic is Bronislau Kaper's epic Prokofiev-flavoured symphonic score for the sweeping 1958 MGM drama The Brothers Karamazov (which starred Lee J. Cobb, Yul Brynner, Claire Bloom and a young William Shatner). The Film Score Monthly CD features Kaper's complete score, in its original mono format, together with a collection of source music used in the film. The disc is accompanied by a twenty-page booklet with extensive notes on the film, and detailed track notes. RRP for the disc is $19.99. Both discs can be ordered directly from the Film Score Monthly website, or are available from specialist soundtrack retailers. In other soundtrack news, La La Land Records, who released John Harrison's Creepshow and Richard Band's From Beyond earlier this year (see the News entry for the 28th of July) have announced that they're going to release a two-disc edition of Secret Weapons Over Normandy, the latest LucasArts video game score by the very talented Michael Giacchino (check out his scores for the The Lost World: Jurassic Park and Medal of Honor games); Dominic Frontiere's score for John Wayne's 1975 London-based detective movie Brannigan; and, most intriguing of all, The Fantasy Film Worlds of George Pal, which will feature music from Atlantis - The Lost Continent, Doc Savage - Man of Bronze, The Power and one of my favourite films, The 7 Faces of Dr. Lao. Yo ho ho and a bottle of rum! It will be interesting to see if Momentum can make a success of re-launching catalogue title Cutthroat Island in the wake of the mighty Pirates of the Caribbean (a film I've now had the pleasure of seeing in four different languages, incidentally!) Their Cutthroat Island Special Edition DVD, due on December the 1st, features a new commentary track by Director Renny Harlin (which begins by admitting that the film was a box-office flop in the US), six minutes of Making of... behind the scenes material, and a collection of interview footage with Geena Davis (9m), Matthew Modine (10m), Frank Langella (1m) and Renny Harlin (11m), some taken from press junkets, some taken on-set and in costume. The film has a new anamorphic 2.35:1 transfer, and Dolby Digital 5.1 audio (at 448kpbs). For more information check out the News entry for the 23rd of October. Check out a few of the new DVD menu screens here. Christmas might be looming for all of us in the real world, but the DVD companies are already targeting the next big marketing opportunity: Valentine's Day! 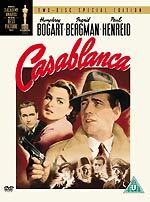 Warner Home Video are spearheading the launch of two new Humphrey Bogart box sets with a new presentation of one of the most romantic films ever made, Casablanca, on February the 9th. 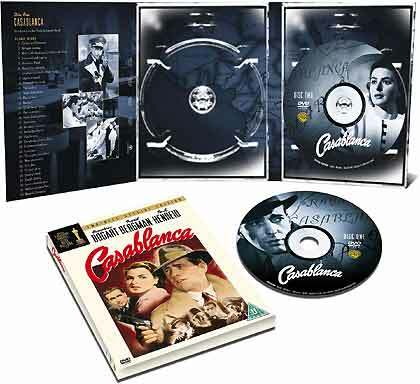 The new two-disc version of Casablanca features a newly digitally-remastered version of the film (a full-blown restoration project handled by Lowry Digital Images), introduced by star Lauren Bacall. The film will be supported by two commentary tracks (by Sun Times critic Roger Ebert, and film historian Rudy Behlmer, author of Inside Warner Bros). The second disc features a wealth of contemporary material from Warner's vaults, including ten minutes of recently-discovered deleted scenes and outtakes! The disc will also feature two documentaries hosted by Bacall: You Must Remember This: The Making of Casablanca (30m, 1992) and Bacall on Bogart (86m, 1992). 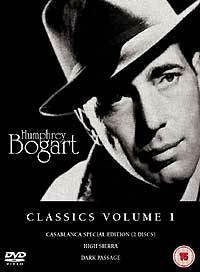 Other bonus materials include memories of Bogart from family and friends in the featurette The Children Remember; the Looney Tunes paying homage in Carrotblanca (1995); the first episode of the short-lived 1955 Casablanca TV series; a Screen Guild Players Radio Production adaptation featuring three of the film's stars; production history gallery, photos, press materials, studio correspondence and memorabilia. The film will be presented in 1.33:1 ratio, with mono audio. RRP for the separate version of Casablanca is £19.99. The Humphrey Bogart Classics Volume 2 set contains the fabulous 1948 thriller Treasure of the Sierra Madre, the 1944 romance To Have and Have Not and the 1940 truck company drama They Drive By Night. Treasure of the Sierra Madre will feature a commentary track by Bogart biographer Eric Lax, a new documentary, Discovering Treasure: The Story of the Treasure of the Sierra Madre and a trailer. The film has recently been released as a lavish two-disc special edition in the Region 1 Warner Legends Collection box set, which features additional bonus materials, which attempt to recreate what a trip to the movies might have been like in 1948, including newsreel footage, a comedy short, and a cartoon. It also features a 1949 radio adaptation of the story, featuring Bogart and Walter Huston. Apparently these features will not be in the UK box set. To Have and Have Not comes with a featurette, A Love Story: The Story of To Have and Have Not, a 1946 cartoon, Bacall to Arms, and a theatrical trailer. (The American DVD also features a 1946 Lux Radio Theatre adaptation of the story, featuring Bacall and Bogart). They Drive By Night comes with a featurette called Divided Highway, a 1938 Warner Brothers short titled Swingtime in the Movies and a theatrical trailer. (The US DVD also features outtakes, a musical short, a cartoon and radio play). 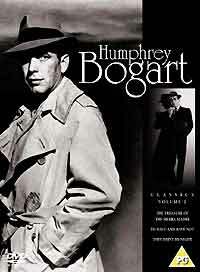 The Humphrey Bogart Classics Volume 1 box sets has an RRP of £34.99, the Humphrey Bogart Classics Volume 2 is £29.99. Two versions of the Robin Hood legend are being released by Warner Home Video on January the 26th, as two-disc Special Editions. 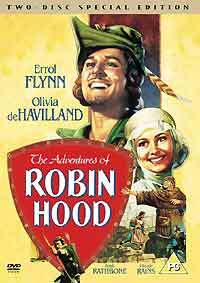 The Oscar-winning 1938 classic The Adventures of Robin Hood, which stars Errol Flynn and Olivia de Havilland, has also undergone extensive 'Ultra-Resolution' restoration work (a process that starts with a transfer of the three original separate black and white three-strip preservation elements). The film is supported by a commentary track by film historian Rudy Behlmer, and a music-only track featuring Erich Wolfgang Korngold's monumental Oscar-winning score. The film is another featured in the American Warner Legends box set, and so has the same type of 'Night at the Movies' themed bonus materials as the US Treasures of the Sierra Madre set, including vintage newsreel, a music short, and a cartoon (in this case Katnip Kollege). The second disc features an fascinating hour-long documentary about the Technicolor process, Glorious Technicolor, hosted by Angela Lansbury. and a brand new behind-the-scenes documentary, Welcome To Sherwood. It also includes two classic Looney Tunes cartoons (Rabbit Hood and Robin Hood Daffy), two Warner shorts (Cavalcade of Archery and The Cruise of the Zaca, which features Flynn); a Robin Hood Through the Ages featurette (looking at various screen adaptations); A Journey to Sherwood Forest (home movies and behind-the-scenes footage); outtakes, a 1938 Warner Brothers blooper reel, and various galleries and production notes. (The UK disc seems to be missing a radio adaptation and audio from the film's scoring sessions). The Adventures of Robin Hood will be presented in full-frame format, with mono audio. 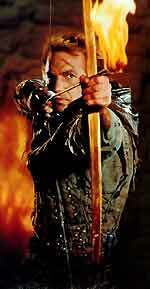 The 1991 version of the legend, Robin Hood - Prince of Thieves isn't able to boast a central performance as charismatic as Flynn's, but Kevin Costner is a reasonable facsimile. The new DVD version features an extended version of the film (which is twelve minutes longer than the theatrical version). The new disc boasts two commentary tracks: one by star Costner and director Kevin Reynolds, the other by co-stars Morgan Freeman and Christian Slater, and writers/producers Pen Densham and John Watson, and composer Michael Kamen. The second disc features a documentary, Robin Hood: The Man, The Myth, The Legend (hosted by Pierce Brosnan); interviews with the cast; a live version of Bryan Adams' hit Everything I Do (I Do It For You) (the disc doesn't include the original music video, unfortunately) and a photo' gallery. Annoyingly, the new version of the film is still cut by the BBFC, although the cuts are less severe than before. The new version is cut by 28", although some of this may be substituted with alternate material. The BBFC apparently insist that a new version of a film must have the same certificate as a previous version, if that version is to remain in circulation (on VHS, for example). 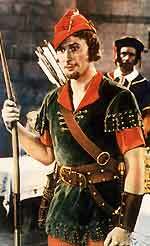 In the case of Robin Hood - Prince of Thieves. Here's how the BBFC database justifies the cuts: "Cuts required to violent detail, strong language, hanging and sexual assault detail in order to maintain previous PG category in accordance with the Video Recordings Act 1984, BBFC guidelines and reclassification policy". The film will be presented in anamorphic 1.85:1 widescreen format, with a Dolby Digital 5.1 audio mix. The American version was released a while ago, and was widely criticised for its transfer, so let's hope the UK version is an improvement. 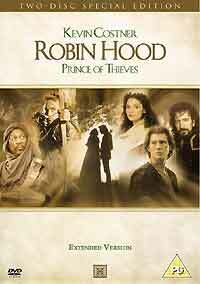 The Adventures of Robin Hood and Robin Hood - Prince of Thieves each have an RRP of £19.99. Finally - phew! - don't forget to check out the review of Universal's forthcoming two-disc Hulk DVD, which was added to the site late last week. You can find the review here.